I’ve always been afraid to grill corn. Well, afraid is probably the wrong word. Lazy? Impatient? Those would probably be better! It takes a little more prep work and it takes longer to cook on the grill, as opposed to the stovetop or microwave. 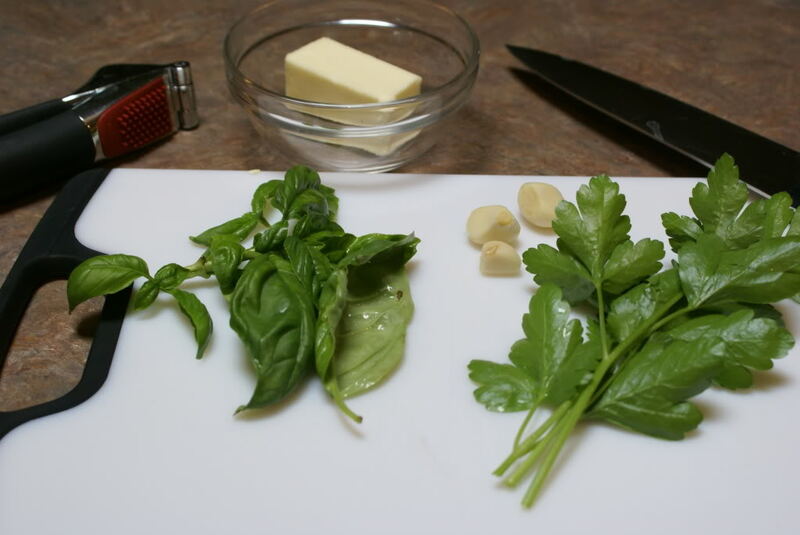 Melt 4 Tbsp butter, crush 3 garlic cloves, and finely chop handful of basil and parsley. 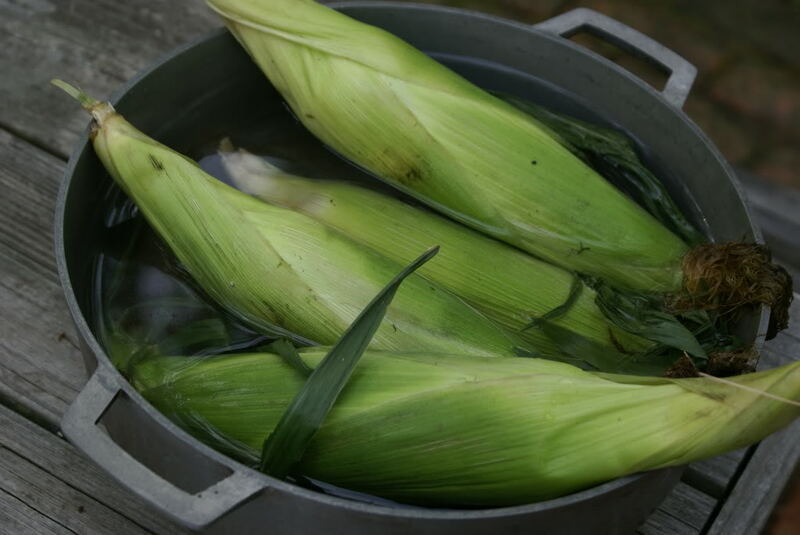 Soak whole corn cobs in cold water for 20 minutes. Peel back the husk as far as you can without it falling off the stalk at the bottom. Then remove threads. Brush the sauce over half of the corn and then wrap the first layer of husk over the sauced portion. Flip corn over. Finish brushing with sauce and the wrap the rest of the husks. If there is enough “slack” in the husks, gently tie them husks into loose knot to hold the husks in place. If there is not, twist what slack there is and place onto the grill. Grill for 25-30 minutes, turning often. Remove from grill and let cool before peeling back husks. 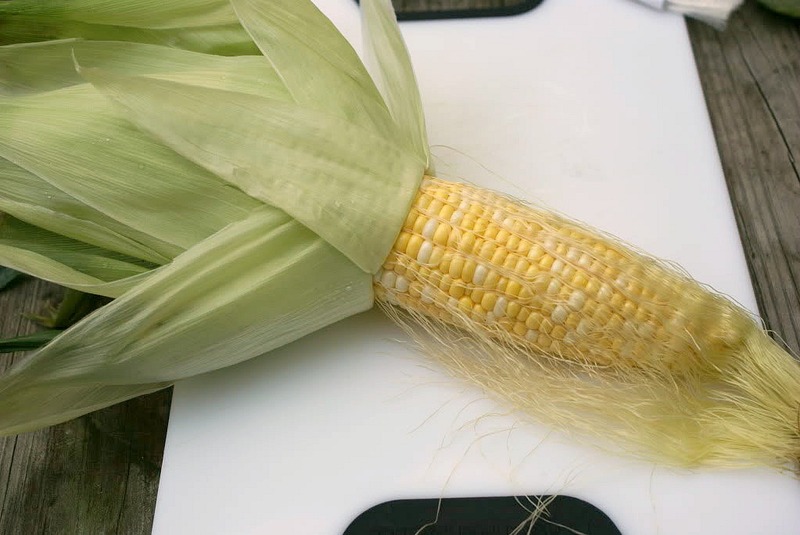 Remove husks and enjoy a delicious grilled corn cob! 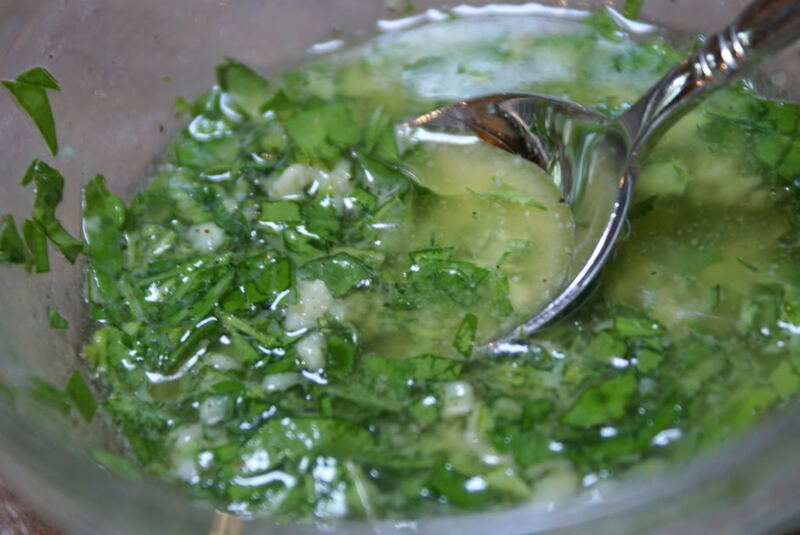 Melt 4 Tbsp butter, crush 3 garlic cloves, and finely chop handful of basil and parsley. Mix it all together. 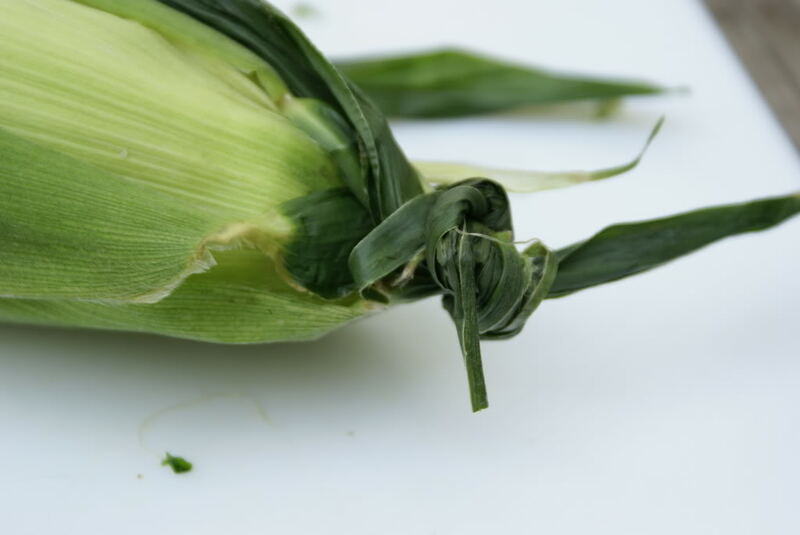 Peel back the husks as far as you can without it falling off the stalk at the bottom. Then remove threads. Finish brushing with sauce and then wrap the rest of the husks. If there is enough “slack” in the husks, gently tie them husks into loose knot to hold the husks in place. If there is not, twist what slack there is and place onto the grill. 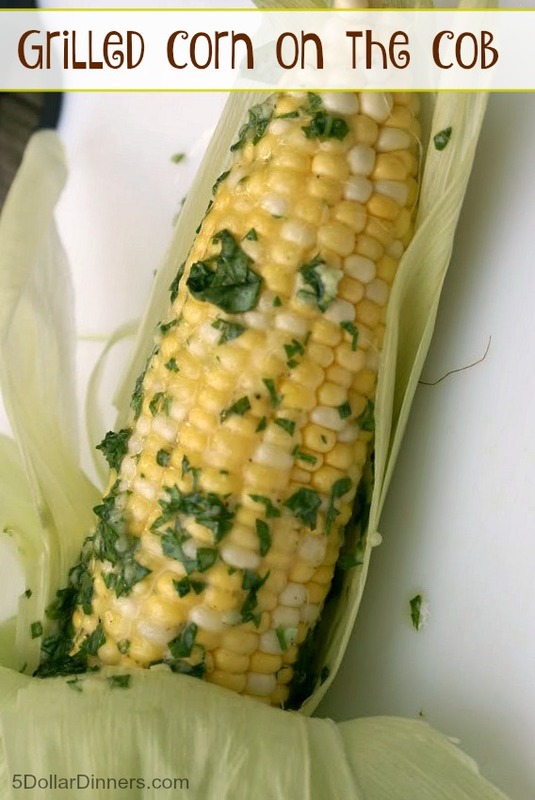 this sounds so good, but I don’t even remove the silk when I grill corn. Just cut the top of the husks down to about the top of the ear of corn and throw on the grill. No soaking, nothing. Soooo easy. This is my absolute favorite way to grill corn on the cob. Sometimes we spice it up and add crushed red pepper flakes or we add some parmesan cheese to the butter mixture. It’s always sooo tasty! I have felt lazy about doing corn this way too. I usually microwave it, but that looks very good. I saw another food blogger who wrapped the corn, husks and all in foil after prepping it. I guess if you did that maybe you could skip the soaking step?? I’ll have to try it and see. That looks good. Nice…i was just wondering how you’d grill corn. Its almost summer time and grilling has been on my mind 24-7. Thanks for this post….LUV IT!!! 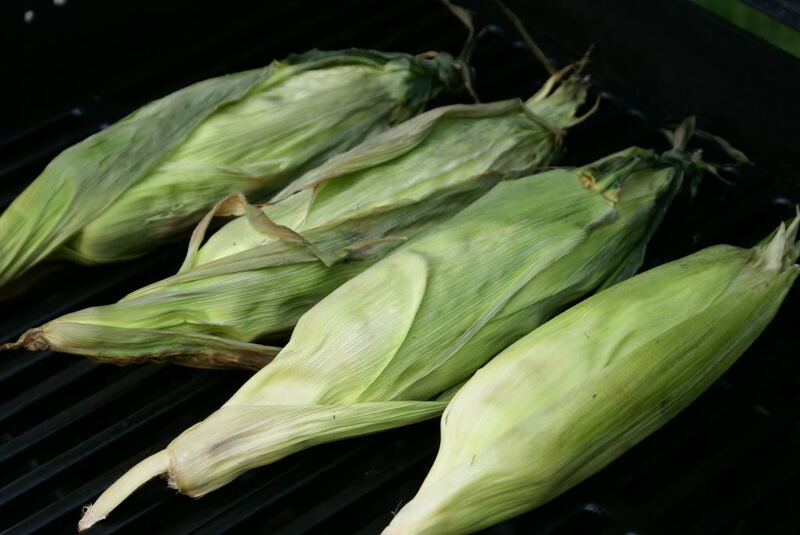 We LOVE corn on the grill…I must admit I’ve never done it in the husks (I always wrap mine in foil — need to try the husk method! ), and I usually make up my butter sauce as I go along…will have to try this recipe! I love grilled corn! Thanks for the reminder on how easy this can be. We LOVE grilled corn. I just wrap in foil with a little butter. It is amazing the different flavor by grilling. It is the only way my daughter wants to eat corn! Great recipe Erin. I’m such a simpleton, previously just boil the corn and slam the butter on when it’s ready. This recipe I gotta try tomorrow. Oh that sounds so good! I can’t wait to get our grill! I wish I had read your post before I cooked dinner! I will try grilling corn next time I serve it. This is how we grill corn, except we add sugar to the water! What temperature do you grill the corn on a gas grill with low, medium, high settings and a thermometer? I can’t wait to try it! No idea…Hubs grilled it! I know he doesn’t use a thermometer. We will definitely have to try this. Thanks for sharing! What a great idea! 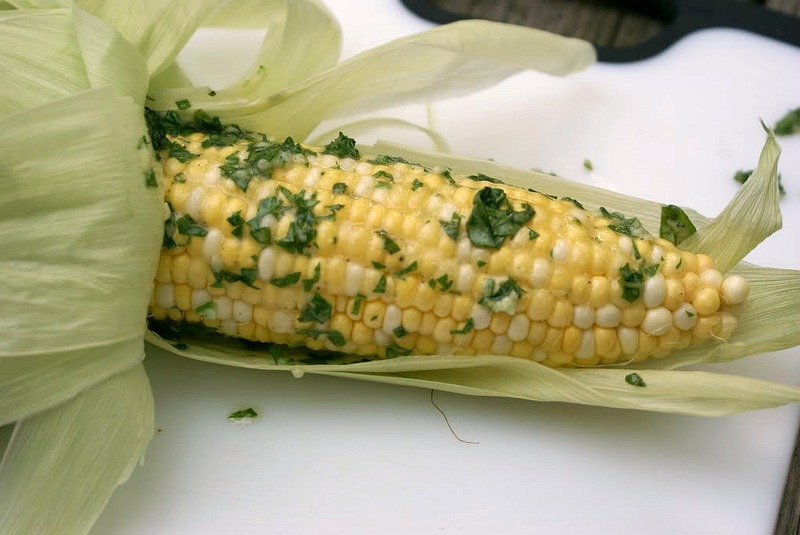 I grilled corn night but did so in foil packets rather than in the husks — I’ll have to give this way a try! That corn looks awesome! I haven’t had corn on the cob in awhile!! Thanks for the tutorial Erin! This looks awesome! Definitely going to try this! Oh my! This recipe came just in time. 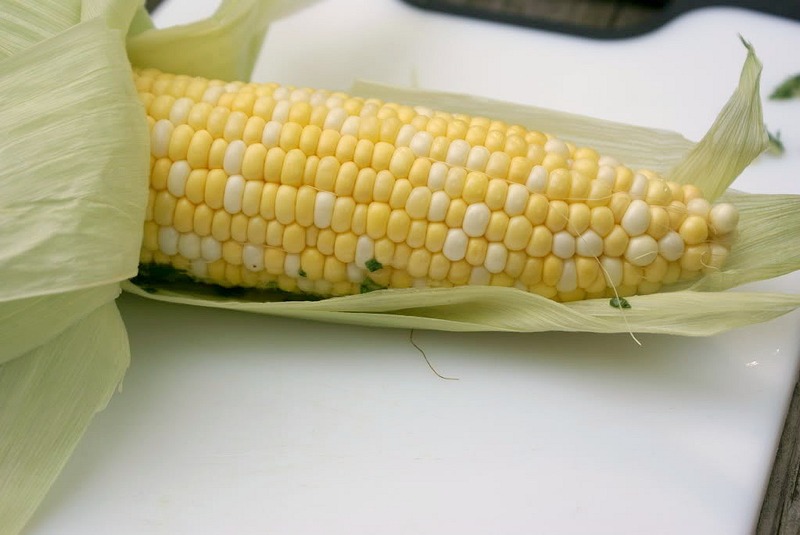 I’ve got corn in the fridge ready to grill and was looking for a new recipe to grill it with! Thanks! That looks delicious! I love grilled corn – especially when you can get 6/$1 this time of year! I like grilled corn.. now I can make it in a better and easy way. Thanks!! awesome. will def try this… probably this weekend. may be a stupid question but I’m new to the whole grow your own veggies/herbs… how do you know when your basil is ready to pick? is there a certain time you can use it or is it pretty much ready whenever? I tried this the other night and it was awesome!! My picky 8 year old even ate an ear. Thanks for the great recipe! I have been grilling corn a slightly different way for a while. I take everything off, husks, silk…..just like you were going to boil. Then make up a butter mixture with whatever herbs sound good to you (I’m kinda partial to the Herbs de Provence mixture). Put the corn right on the grill, low heat — baste often with butter mixture, and also turn often — in 15 mins or so you’re ready to rock. I won’t do it any other way now, and everyone LOVES it!! I have tried this recipe and it is very tasty! The garlic is a bit strong, but I love garlic so I didn’t mind. 🙂 Great recipe! I don’t have a grill, so this is my fake-grill recipe for corn on the cob. Preheat oven to 350 F. Place whole corn cobs (including husks) in oven on rack. Cook for 1 hour, turning oven. Peel husks and silk. They practically fall off. Serve with favorite butter-herb mixture. Don’t forget to clean your oven afterwards. I place a baking sheet on the bottom rack to help with clean up.